HS2 Ltd has received 96 blight applications from home owners on the estate, which would be affected by the path of the planned high speed rail line where it is due to pass through Mexborough. Of those, 91 have already now been approved. Two applications are currently being processed and three await receipt of further information. There are around 165 houses on the estate. * pay ‘reasonable’ expenses, such stamp duty, surveyors’ and legal fees, and removal costs. Residents have been critical of the ‘unblighted value’ figures which had been described as too low to obtain comparable properties, leading to proposals for loan scheme, which was discussed at a Mexboroiugh Advisory Forum. Councillors representing Mexborough say they are concerned that there have not been any of the Mexborough Advisory Forum meetings since February. Coun Gibbons added there were also increasing numbers of empty properties currently on the estate.. The Department for Transport says more forum meetings could be arranged if required. HS2 issued a statement on the issue of meetings. Broader HS2 plans were displayed at an event at Mexborough Business Centre in June. HS2 also says the next major stage of public consultation on the schemes, which will look at issues such as environmental impact, will start in the next few weeks. Officials also say a 12 month delay in the passing of the legislation required to progress the scheme will not affect the timescale for the proposed railway plan. 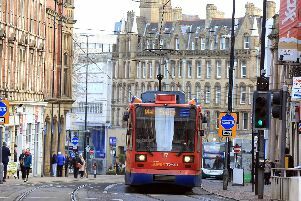 The Government is looking to impose a 12-month parliamentary delay on the legislation needed to extend HS2 to Manchester and Leeds. The hybrid bill is now expected to be tabled in two years’ time, although the government promised the pause would not impact on the 2033 completion date. Paul Griffiths, the managing director for Phase 2, announced he was going to leave the company after three years the day after the Government delay was revealed.